Come and join us for the all new Monday Madness where we will be featuring $5 Patrons and $5 Crowns ( all flavors ). We will also have 20 wings for $11. Come and see all of our ClubOnyxBeauties. Hookahs, full kitchen, and valet parking are available. ClubOnyxHouston would like you come and join us for the World Famous $2 Tuesday. We are featuring $2 Hennessy $2 Grey Goose $ Wells and $2 Domestics. Over 50 of our ClubOnyxBeauties. Full kitchen , hookahs, and valet parking are all available. Come and join us for the new Royal Wednesdays where we will be featuring $5 Hennessy. We will also have 20 wings for $11, and over 50 of our ClubOnyxBeauties. Full kitchen / hookahs / and valet parking are all available. Club Onyx Houston would like you to join us for our new Tipsy Thursdays. we will be featuring 2 for 1 signature bottles, and $5 Hennessy. To top it off we will also feature $14 T-bone steak baked potato and fried shrimp. Over 50 of our ClubOnyxBeauties, hookahs, and valet parking available. ClubOnyxHouston would like you to come and join us for our all new Fantasy Fridays. We will be featuring $5 Patrons. Over 50 of our ClubOnyxBeauties, full kitchen, hookahs, and valet parking are all available. ClubOnyxHouston proudly presents the livest party in Houston hosted by over 75 of our ClubOnyxBeauties. Hourly shot specials throughout the night. Full kitchen, hookahs, and valet parking are all available. To become a Club Onyx Houston entertainer or to apply for other employment opportunities, visit our career section or call for more information. Making a reservation at Club Onyx Houston is as easy as knowing your name. A Club Onyx Houston Coordinator will contact you shortly after your purchase is complete. Club Onyx Houston has the utmost respect for our guests and their privacy. 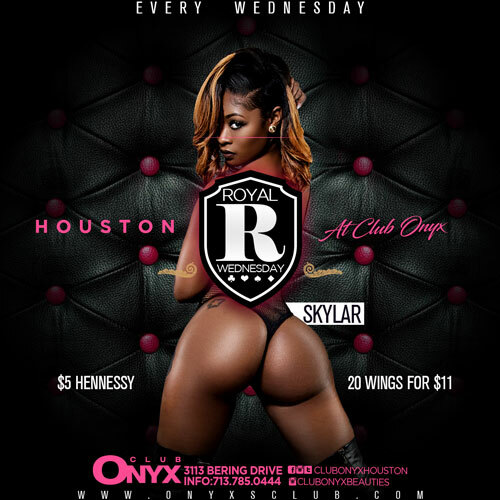 Your information is only used by Club Onyx Houston to complete your reservation. Should you have any questions during the online reservation process please feel free to contact us via email or give us a call.